This free Bible lesson is based on John 3:1-17 when Jesus speaks to Nicodemus about what it means to be born again. It is designed for children’s church or Sunday School. Please modify as best fits your ministry. If your church follows the Revised Common Lectionary, this teaching plan would correspond to Year B – Trinity Sunday, Gospel Reading – John 3:1-17. Play a game of hangman about all things baby. Use some of the suggestions below or make up your own. I can’t talk, but I can cry. Ten fingers, and ten toes. Babies like to be held. Babies love to hear your voice. It takes a lot to take care of a baby. Have you ever seen a pregnant lady before? How do you know she is pregnant? Her belly! And why does her belly get so big? Because a baby is growing inside and as the baby grows, her belly grows. Do you think I could fit back in my mom’s belly? Do you think I’m too big? Well, what about you? Could you fit back in your mom’s belly? You’re too big too! These questions might sound a little silly, but someone actually asked Jesus these same questions. His name was Nicodemus, and he was confused about being born again. Have you ever heard someone say that before? Born again Christian? Or maybe born believer? 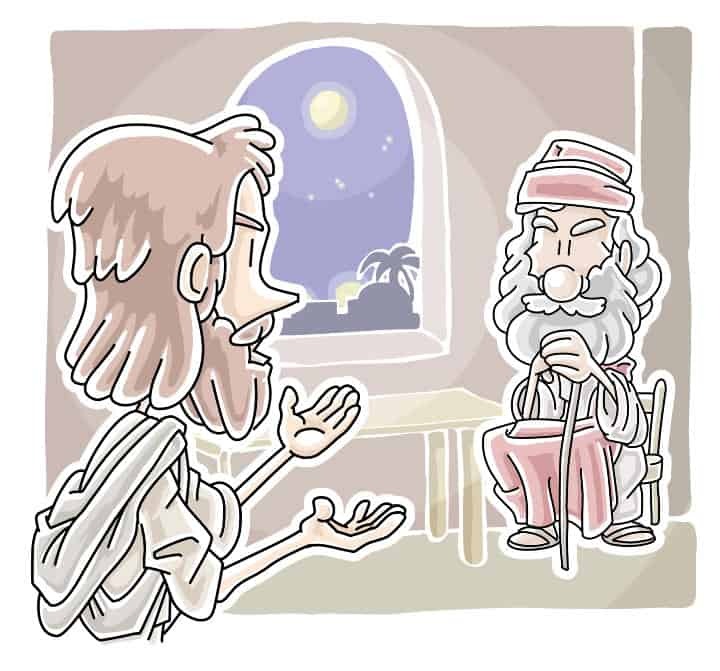 Nicodemus hadn’t and when Jesus told him he needed to be born again in order to get heaven he thought it was impossible. How could he possibly get back in his mom’s belly? But do you think that was what Jesus wanted him to do? No! Jesus meant a totally different type of born again. Jesus told Nicodemus that there are two different types of being born. The first time we are born is when we come out of our mom’s belly. This is called being “born of the flesh”, and this is something we can see. Hold out your hand and look at it. That’s your flesh! It’s your arm and legs and nose and toes. When we are born of the flesh, do we know how to walk? Talk? Tie our shoes? Nope, nope, and nope. We don’t know any of that stuff. But no worries, our parents are there to take care of us. And slowly as we get older, they teach us how to do things; like read, or throw a baseball, or bake a cake. Now this is the part Nicodemus didn’t understand. Being born again. And this time it is called being “born of the spirit”. Everyone hold out your spirit and look at it. Are you holding it out in front of you? Can you see it? Our spirit is the part of us we can’t see, but I promise it’s there. Being born of the spirit can happen at any time no matter how old or young. And in order for this to happen, all you have to do is believe in Jesus and accept His gift of eternal life. And just like babies have parents that teach and take care of them after they are born, when you are born again you have another parent to be right there with you. Do you know who that is? It’s our Heavenly Father, God! We really can be born twice, and both times are very important. We wouldn’t be here if we hadn’t been born as babies, and we wouldn’t get to heaven if we hadn’t been born again. And the neat part about being born again is all of the amazing new brothers and sisters you get. Anyone who is born again becomes a brother or sister in Christ to every other Christian, because we all share the same Heavenly Father. That makes us part of one HUGE happy family! Give the children supplies to draw and color 5+ people each. Then have them cut out each person and tape them to the mural paper. Encourage them to make each person different, with different hair colors, skin colors, clothes, etc. to represent everyone who is part of God’s family. *To make this project go quicker print outlines out before class and just have them fill them in. Ask for a volunteer to pray for the class before leaving, and encourage them to thank God for loving so much. Wow this is so amazing thanks so much may God bless you.